Description - Shaw's Pure Envy broadloom carpet is part of the TruAccents collection and boasts an attractive color selection and textile pattern. The modern and alluring styling adds a fashionable touch to any space in need of some coolness. 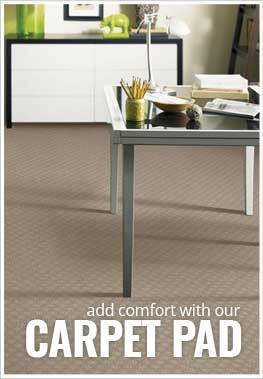 Sophisticated and durable, this comfortable carpet is Made in the USA and is backed by a 20 year warranty. Material - Part of the TruAccents collection, made with 100% Nylon with Softbac platinum backing. Recommended Uses - Pure Envy is recommended for a variety of rooms throughout the home and in commercial spaces, including bedrooms, family rooms, dining areas, offices, libraries, boutiques, waiting rooms, and more.